WHEN YOU THINK of orthodontic treatment, the first things that come to mind are braces and retainers. But there’s more to orthodontics than that! Depending on your child’s unique case, we may use other orthodontic appliances to help them achieve a beautiful smile. One of these appliances is an orthodontic, or palatal expander. A palatal expander is a specially made appliance used to widen the palate or roof of the mouth. This appliance is usually used for younger patients whose jaw may be too narrow to accommodate incoming permanent teeth. When the jaw is too narrow for the adult set of teeth, crowding and bite misalignment may develop. If a narrow upper jaw is left untreated and crowding and bite problems occur, a person may have difficulty with chewing, speech and other functions. It may also cause a need for more dental work as an adult. Put simply, an expander is used to widen a narrow palate early, helping big teeth fit into little mouths! The first couple of days with an expander may be an adjustment for your child. They may report some discomfort such as a feeling of pressure in the mouth or behind their nose. This pressure fades quickly on its own but over-the-counter pain relievers can also help. In addition, your child may speak differently for the first few days or slurp more than usual due to an increase in saliva production. All of this is normal and will go away as they get used to the expander in their mouths. Since your child’s mouth may be a bit sore, eating fun foods that require minimal chewing like yogurt, ice cream, jello, mashed potatoes, pudding, etc. may help them adapt. Normal eating should resume within a few days. As with any orthodontic appliance, it’s important for your child to keep their expander clean. They should brush twice a day as well as continue daily flossing. Since food may be more prone to get caught under your child’s expander, we recommend a water jet or syringe after meals and before bedtime to flush out any remaining debris. Everyone is unique and may require a different combination of treatment to achieve a beautiful, healthy smile. 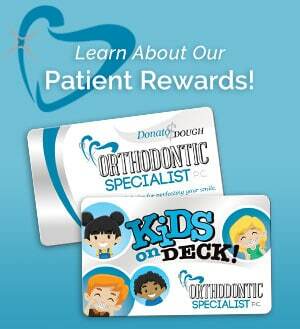 Our goal is cater to your child’s individual needs to bring about the best results. Do you have any questions about palatal expanders? Give us a call or leave it in the comments below! We always love to hear from you.